Innovative ocean-borne technology, utilizing a dual rotor system and wave ramp to capture all the power contained in a wave, is a highly efficient wave energy converter that actually lowers the cost of delivered electricity. The simple fact of the matter is that worldwide energy demand is rapidly outstripping supply. According to the National Academy of Sciences, experts are predicting a 35% increase in the demand for electricity in the United States by 2030. While we know that fossil fuels are in limited supply, more than 70% of current power demand is being met by coal, natural gas and petroleum. As energy consumption continues to grow, renewable energy is becoming increasingly important. Water usage is another concern with most energy production methods requiring vast amounts of fresh water to operate – cooling steam from the turbine back into water. The water loss for thermoelectric plants such as nuclear, coal, gas, oil, geothermal, and solar collector towers is at 0.47 gal per kilowatt-hour (kWh), and for hydroelectric reservoir evaporation it is 18 gal per kWh. The search is on for viable renewable energy sources to meet our growing needs. There are various types of renewable energy options available that do not require fresh water, such as solar, wind, and ocean power, which begs the question: if these renewable energy sources have the potential to meet our needs, what is holding us back? There are several drawbacks to existing renewable energy options, including high installation costs, low power conversion rates, the high cost of delivered energy, limited predictability, and societal impact. Power conversion rates, or how much useful energy is ultimately provided from the potential, is an important factor for any energy source. Solar photovoltaic power has an estimated maximum conversion rate of 24% at mid day, while wind is at 45% maximum and conventional ocean power provides 8-18%. Meanwhile, if coal generates more than 60% of all electrical power in the U.S. maxing out at a conversion efficiency of 40%, how can renewable energy sources hope to compete? Affordability is also a key issue. Solar power can cost 15-30 cents per kilowatt ($/KW), wind power 5-7 $/KW, and existing ocean technologies 8-16 $/KW, while coal, the predominant power source across the globe, is currently one of the more affordable options, at approximately 4.8-5.5 $/KW (CHART 1). In addition, limited predictability is a serious obstacle facing existing renewable energy sources. The increasing global demand for power does not wait for the sun to shine, the wind to blow, or the right wave to come along. Finally, societal impacts such as aesthetics and noise-level can be problematic for those who live near renewable energy installations, such as wind farms. The good news is that recent advances in renewable energy engineering and technology have yielded a new hybrid system that allows for ocean to be harnessed from variable U.S. coastal waves more effectively and efficiently. The technology generates a high rate of usable power, delivered at reasonable cost without any serious societal impact, and is ultimately cost competitive with fossil fuels. This new innovation in renewable energy device consumes no water, and can achieve grid party – the point at which renewable electricity is equal to or cheaper than grid power. 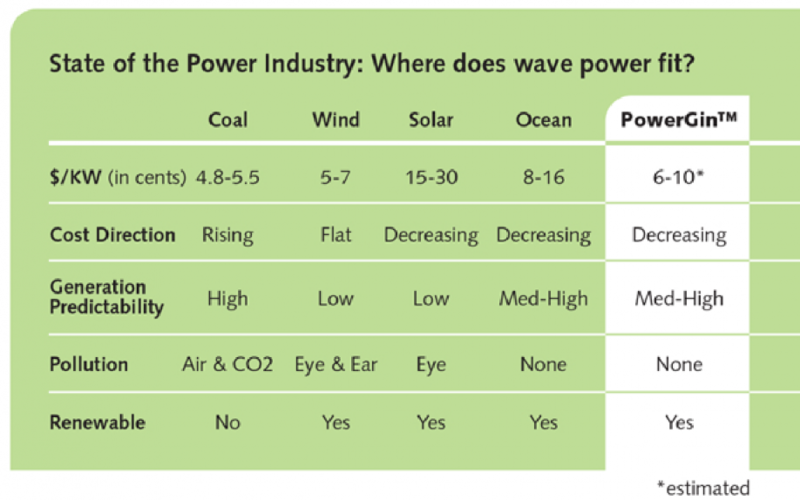 In a sense, wave power takes other naturally renewable energy sources, such as solar and wind power, and combines them to form an incredibly dense source of power. It all starts with wind, a result of the sun heating the air, creating waves, which carry 25 times the potential energy of the solar energy that initially created them. Wave energy is basically super-concentrated solar energy – with the ocean acting as the world’s largest solar collector and concentrator – waiting to be harnessed effectively. In fact, according to researchers at Oregon State University, just .2 % of the untapped energy contained in the ocean would be enough to power the world five times. Existing overtopping and oscillating wave energy conversion technology focuses solely on vertical energy – the rise and fall of a wave from crest to trough, or wave height. While power is generated, this method only looks at half the power picture. A wave is also made up of horizontal energy – the circular and swirling motion containing multiple frequencies of water molecules, or wave length. Advances in the ability to harness ocean power have resulted in a superior wave energy converter that not only captures vertical and horizontal wave energy, but also utilizes inconsistent and lower wave states, typical of US wave action. Using state-of-the-art engineering principles, this innovative offshore wave energy converter is made up of a dual rotor system lined with energy capture units, or “buckets”. Attached to rotors 80 or more feet long and approximately 10 feet in diameter, these buckets catch wave water and use the inherent gravity of the captured water to turn the rotors. The system also captures a significant amount of horizontal kinetic energy contained in a wave, using a loose-moored wave ramp. This ramp re-directs forward water movement into a cresting wave that in turn, turns the rotors (FIGURE 1). Continuous rotary motion drives a generator similar to one used in wind power. Electricity generated is then channeled through undersea cable to a base station located on shore. Existing wave energy conversion systems have a maximum efficiency at around 18%, but usually operate below 12%, due to the variability of waves along the U.S. coast. This ground-breaking technology makes efficient use of inconsistent and lower wave states, harnessing horizontal and vertical wave energy components in order to achieve higher conversion rates of at least 20-30%. As previously mentioned, wave energy is basically made up of concentrated solar energy at rates of up to 25 times that of solar rays. Wave power is also significantly more energy-dense than wind power, providing 8-10 times the power output of wind turbines. Just one wave energy converter, utilizing advanced capture and wave ramp technology, can provide as much as 20MW of output. When looking at alternative power sources, cost is a key concern. Designed with efficiency in mind, the unique wave energy converter produces energy that costs an estimated 6-10 $/KW. 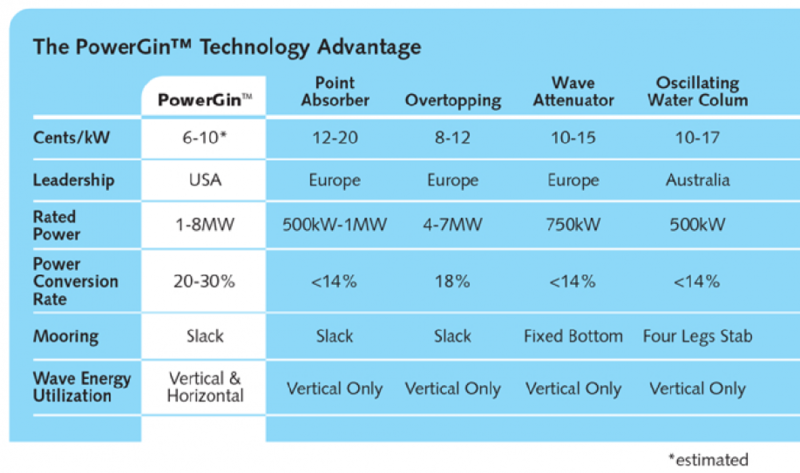 Existing wave conversion technology, including point-absorbers, overtopping, wave attenuator, and oscillating water columns, can cost anywhere from 8-20 $/KW (CHART 2). Grouping more than one of these sophisticated units to form a “power park” can reduce initial investment by spreading undersea cable costs. Dependable and reliable, one of these parks can generate enough energy to power a large city, an industrial site, or an island roughly the size of Oahu. Wave energy converters operate continuously in an extremely challenging environment, making maintenance costs an ongoing concern. Designed with a high-tech polymer concrete that is then reinforced with a proven marine coating, the sophisticated wave energy converter is extremely durable and resistant to salt – a major issue for ocean-borne equipment. Exposed components, such as the “buckets” are made of high performance polymer and are bolt on and bolt off for easy removal during service or replacement. In addition, the gearbox is passively water cooled, using the ocean to increase the life of transmissions and gear shafts. This enhanced survivability means reduced overall maintenance costs, as well as longer product lifecycle. This innovative technology uses a proven technique to focus and concentrate wave energy, converting it directly into continuous rotary motion. This is where the distinctive design sets this technology apart from existing wave capture methods, making efficient use of inconsistent and lower wave states than was previously possible with conventional means. Consistent performance means a steady flow of power. Power needs are increasing around the world, while conventional supply options are dwindling. Fossil fuels are running out and existing renewable energy sources are just not able to shoulder the load – until now. Innovative ocean-borne technology, utilizing a dual rotor system and wave ramp to capture all the power contained in a wave, is a highly efficient wave energy converter that actually lowers the cost of delivered electricity. This state-of-the-art solution solves the major issues facing renewable energy sources today, including solar, wind and ocean power. Water usage, another growing concern, is not an issue with advanced wave energy converter technology. With higher conversion rates and power output, increased efficiency, as well as decreased cost and societal impact, this new wave energy converter can effectively tap a truly sustainable and readily available power source to meet continuously growing power needs. 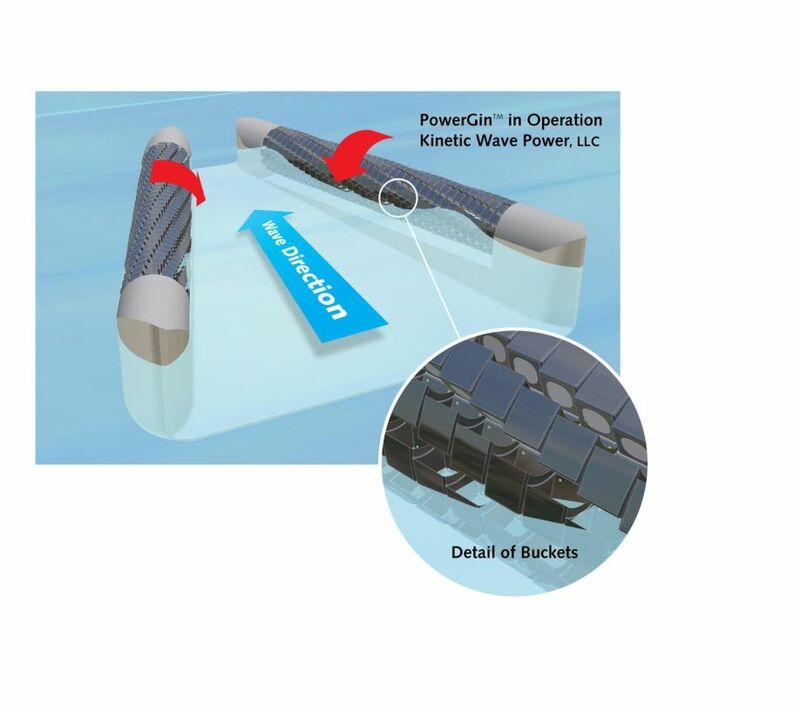 Kinetic Wave Power LLC (KWP) is a technology company that was formed to commercialize a cost competitive wave energy conversion (WEC) technology called the PowerGin™. The PowerGin™ uses engineering principles from state-of-the-art over topping wave technology to rotate an innovative dual rotor system and convert wave energy into continuous rotary motion. It will also capture a significant amount of horizontal kinetic energy contained in the wave by using a wave ramp. Using both forms of wave energy allows much greater energy conversion efficiency than existing WEC technology and allows operation in moderate wave resource areas. This higher efficiency wave energy converter will lower the delivered cost of electricity to a level that will compete with the low cost producer which is coal. Very poorly written article. Confusion between power and energy. Energy is sold as kWh not kW. Is the cost $/kWh or cents/kWh? An article with such poor understanding of the topic is a black eye both for Kinetic Wave Power and altenergymag.com. Learn about competitive systems before comparing to them, i.e. how would an overtopping device work if it did not utilize the horizontal as well as the vertical motion of waves?